Track outcomes assessment, evaluate program quality, and document institutional effectiveness from one central home. Align goals, measures, and plans. Close the loop on student learning more easily by establishing a clear process for assessment across your institution that supports program-level discussions about intended outcomes, assessment plans, and results. Systematically collect, analyze, and report on assessment data so you can confidently tell your institution’s story. Use built-in templates to address specific regional and specialized accreditation criteria. Manage review cycles using an easier process for all with a central system for organizing data, documentation, and feedback. 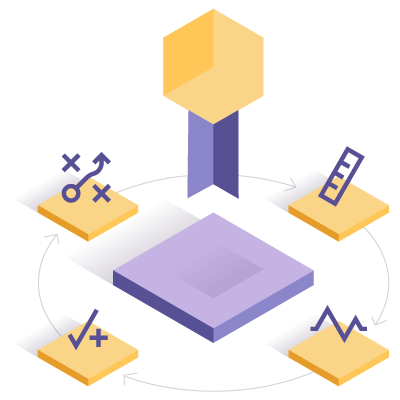 Close the improvement loop with integrated capabilities for tracking action plans, monitoring results, and maintaining data over time. Align outcomes and objectives at all levels to your institution's mission and strategic goals. Monitor progress from a central home where you can track action items by unit, review milestones throughout planning cycles, and manage associated budgets. Provide resources and feedback to faculty and other contributors more easily throughout the assessment cycle. This real-time engagement encourages active collaboration among key stakeholders and helps sustain meaningful assessment practices across campus. 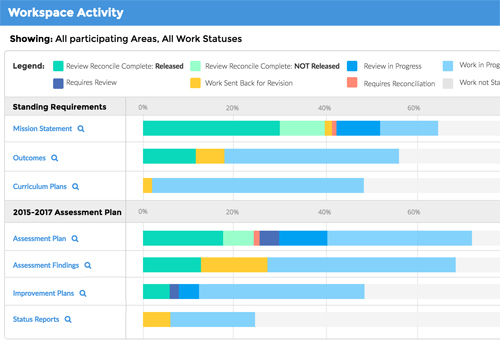 Dashboards and reports provide visibility into where programs are in the assessment cycle. This helps you analyze alignment of outcomes, track progress toward institutional goals, and develop action plans to facilitate ongoing improvements. Organize and share evidence with external stakeholders for accreditation review. Assess and improve co-curricular initiatives to measure learning outside of the classroom. Measure institutional alignment with regional or specialized accreditation standards. Collect, analyze, and report assessment data to prepare for programmatic accreditation. Manage faculty qualifications, tenure track, research, and service more easily in one place. 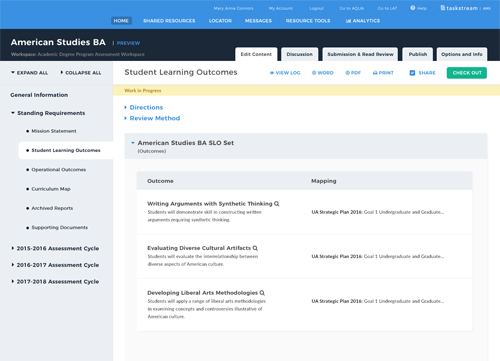 Link student learning outcomes to specified course and program objectives. Align your improvement efforts on campus to get more from your institutional planning efforts. Download the flyer to learn more about taking a centralized approach for better assessment. 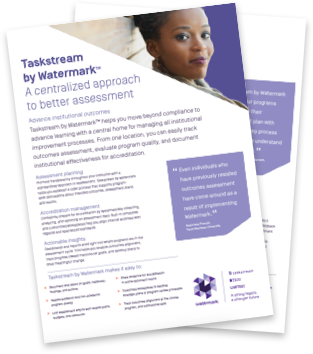 "Taskstream by Watermark enabled our programs to organize their assessment plan with a step-by-step process that they now understand better, as well."